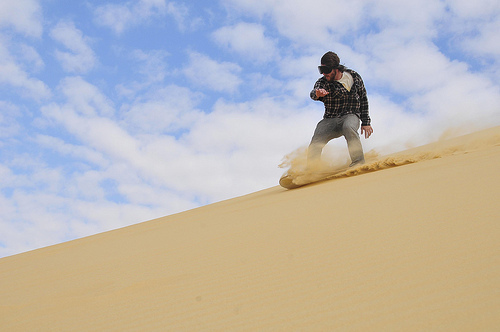 Has Sandboarding Become the Desert’s Coolest Sport? The new craze of sandboarding has caused many extreme sports lovers to take a second glance at what can and cannot be done with a traditional snowboard. Billed as snowboarding’s long-lost twin, sand boarding combines many aspects of what we know to be fun about snowboarding with a desert setting. As the sport has grown and as technology has increased the ability for athletes to perform, the aura of sandboarding has continued to attract both fans and non-fans of desert sports alike. The prevalence of deserts in many climates as opposed to icy mountain peaks has also helped boost participation in hotter, drier areas of the world. Due to these reasons and many more, sandboarding has grown from obscurity into the most popular desert sport around. When sand boarding began, many participants used traditional snowboards as a means of propelling themselves down dunes and sandy hills. While this worked in practice, it was not an ideal way to achieve maximum agility or control of the board. Smooth surface materials such as Formica were later adopted by board-makers as a way to combat friction between the board and the sand, allowing for insane speeds up and down the track. These developments also allowed riders to perform many new and exciting tricks that were not possible before on boards that dragged across the sand. Perhaps even more exciting is the number of venues that sand boarding has to offer. With sand parks on six continents, every rider is sure to find exactly the perfect course to meet his or her expectations. Major parks are located in Australia, Egypt, Namibia, South Africa, the United States, Peru, the United Arab Emirates and in Germany. From the black sands of Nicaragua to the white powdery sands of the Maldives, there is a variety of different types of sand to go along with a wide selection of backdrops, making the sandboarding experience even more exciting. Because there is no sensitive climate range that must be in place to support sand parks, many sand boarding parks are open year-round to extreme sports fanatics. All throughout the year, there are a number of events occurring worldwide that showcase the talents of the best sandboarders around, many of them during the summer as opposed to the winter for snowboarding. Some of these events include the Sandboarding World Championship in Hirschau, Germany, the Sand Master Jam in Florence, Oregon and the Pan-American Sandboarding Challenge in July in Aquiraz, Brazil. Whether you are looking for a fast experience on a downward slope, a change of scenery not typical to snowboarding or doing all of this on a warm, sunny day, sand boarding may be the right sport for you. These reasons have certainly promoted it to the coolest and most popular desert sport in the world. For those extreme sports aficionados who love the idea of a familiar sport with a unique twist and temperate to hot climes with no trace of snow, consider trying sandboarding, the coolest desert sport ever. 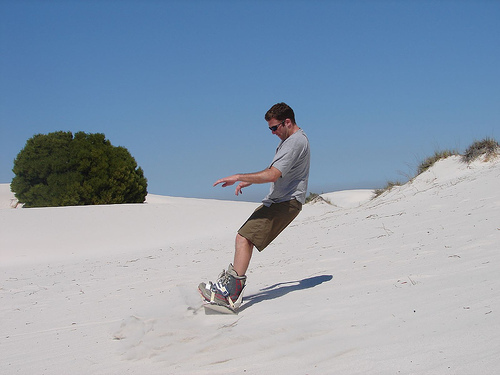 This entry was posted in Bizarre, Sand Boarding and tagged Sand Boarding, Sandboarding. Bookmark the permalink.